The church was about to become a ruin after the fire of 1985, when the wooden roof was lost. The fire also uncovered some architectural elements hidden for centuries. These remains caught the interest of experts and local authorities thanks to the efforts of the local priest to preserve the building. Finally, at the beginning of the 90´s the local government and the bishopric funded the restoration putting in value the Visigothic origin of the church. 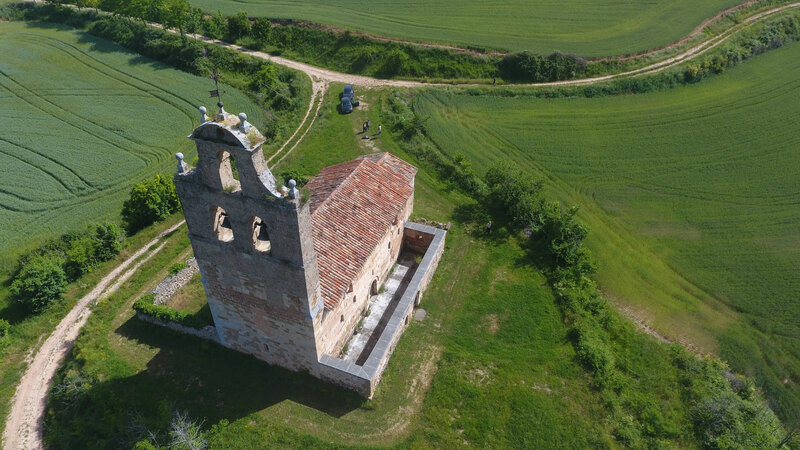 In Moøkan we want to contribute to the preservation and promotion of this piece of the Spanish heritage by digitalizing the church’s volume through the drone photogrammetry. At the end of the spring of 2016, we went to this stunning spot with our flying equipment. Now after completing the digital reconstruction in our offices we publish and share our work here. We hope our models will allow everyone to come closer to the church of La Asunción, having a better experience than just through the photos, and if possible, encourage anyone interested to go to San Vicente del Valle to visit it. The church shows similarities to other pieces of the same period as Santa María de Quintanilla de las Viñas, San Pedro de Arlanza, Santa Cecilia de Barriosuso, San Román de Tobillas, Santa María de los Arcos de Tricio o Santa Coloma. To further deepen on this monument we recommend the text by Fernando Arce Sainz, from the CSIC: La iglesia altomedieval de la Asunción en San Vicente del Valle (Burgos): historiografía, estratigrafía e interpretación. It has been our main source. This time we performed the aerial photogrammetry with a DJI Phantom 4 and supported with more photographs of our DSLR camera. In total we have used 110 images that allowed us to create a model with over 20 million of points. We had a splendid sunny day that allowed us to enjoy an incredibly beautiful view, but the environmental conditions for the collection of data weren’t ideal for a correct digitalization. The best conditions for a photogrammetry is to have a cloudy day. From this data we created three final models. The first and less detailed represents the area, to appreciate the church in its landscape context on one of valley slopes. The other two are more detailed models of the church to appreciate many more details, one made only with drone photography and the other with a mixed technic. We have optimized these models lowering its polygon number for the online version, and we are sharing it here with you in Sketchfab from where you can download it for free. On this models the discarded detail is provided by the texture on the normal layer. We show both models since they have different level of detail. The mixed technic model has a more detailed geometry showing cornice elements that weren’t captured by the photos of the drone. Due and incident with our equipment, the lens of our DSLR was damaged so the texture presents some defects and blurry areas. The model done only with the photos of the drone has a higher definition of the textures. As result of the photogrammetry we can also explore the geometry without the texture to appreciate some details that otherwise would be hidden or hard to see. We can see an example on the roof. When we explore the model we can perceive some lines that appear on the roof separated an equal distance. The first idea was that it could be cause by a deformation of the roof and showing the position of the beams. The images of the cornice and the interior showed us that wasn’t a valid theory since we could see a higher number of beams. Finally, after studying carefully the photos we discovered these lines were more obvious from some angles. They are rows of tiles reinforced with cement mortar to ensure the durability of the roof. That makes that row to stand out slightly above the rest. To see the 3D model in other graphic modes, select the button options on the Sketchfab visor, render, and choose between the different modes. The photogrammetric study is also a scientific tool to study objects, buildings and terrains, allowing us to see much more than the obvious and analyze an element or site without going to visit it. A tool of great value to analyze projects of intervention in the architectural heritage or other existent structures as well as for topographic analysis. Buenos días, soy una vecina de San Vicente del Valle y me gustaría saber cómo, cuándo y porqué hicisteis esta grabación, me parece muy interesante. Gracias.